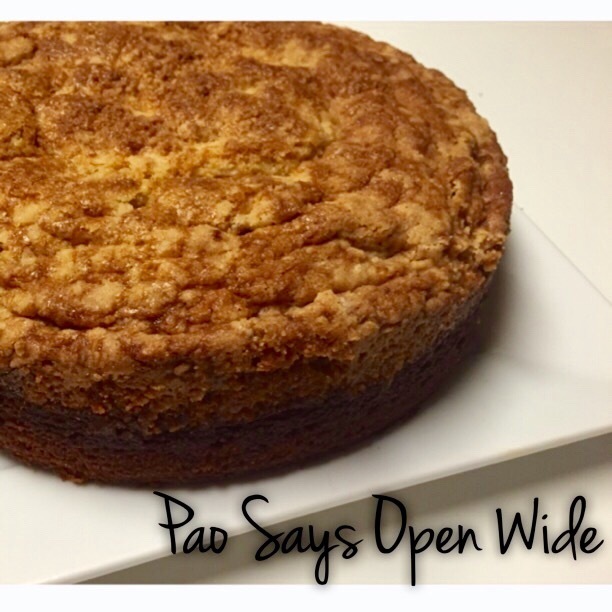 Move Over, Pumpkin Pie: Pumpkin Layer Cake – Pao Says, "Open Wide!" My mom sent me a box full of Fall goodies a week or two ago. Among the goodies in this very welcomed care-package, I found a Williams Sonoma pumpkin bread mix, a box of Jiffy yellow cake mix, a jar of Williams Sonoma pecan pumpkin butter, and a recipe… I felt like mom had sent me a treasure map, and all I had to do to get the treasure was combine the supplies. Let me tell you… the cake that came of this recipe was truly a treasure. I say “was” because, sadly, it’s all gone. First layer to go down is the quick bread. Mix the pumpkin bread according to the directions on the package, and pour the mixture into your baking pan. Next, mix the jar of pecan pumpkin butter with 2 eggs and a splash of milk. Pour this over the quick bread mixture. For the top layer, use a fork to mix 1/2 stick of softened butter with the jiffy yellow cake mix until well-incorporated and crumbly. Sprinkle this topping evenly over the cake. Bake for 45-55 minutes. As per instructions “this is a moist cake but it should not be soupy. Cake should be golden brown on top and done in the center”. Mine took about 55 minutes, but it usually takes just 45 in my mom’s oven- start checking your cake at the 40-45 minute mark and adjust your time accordingly!